NIH-funded study finds consistent, dramatic improvements among clinical trial participants. 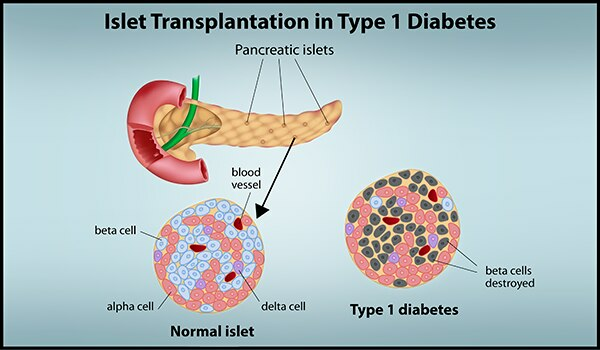 According to a study published online March 21 in Diabetes Care, quality of life for people with type 1 diabetes who had frequent severe hypoglycemia improved consistently and dramatically following transplantation of insulin-producing pancreatic islets. Islet recipients reported better overall health status after transplant, despite the need for lifelong treatment with immune-suppressing drugs. These improvements were observed even among transplant recipients who still required insulin therapy to manage their diabetes. 42 participants (88%) were free of severe hypoglycemic events and had established near-normal blood glucose control and restored awareness of hypoglycemia. Approximately half of the transplant recipients needed to continue taking insulin to control their blood glucose levels. According to study authors, the elimination of severe hypoglycemia and the associated fears accounted for these improvements, appearing to outweigh concerns about the need to continue insulin injections. Islet transplantation is an investigational therapy in the United States. While promising for people whose type 1 diabetes cannot be controlled with standard treatments, the procedure is not appropriate for most people with type 1 diabetes due to its associated risks.